Now that Thanksgiving is officially over and the Christmas tree is up, I feel like I can officially move on to Christmas. I really love this time of year, and not because it means that my birthday is just a few days away either. 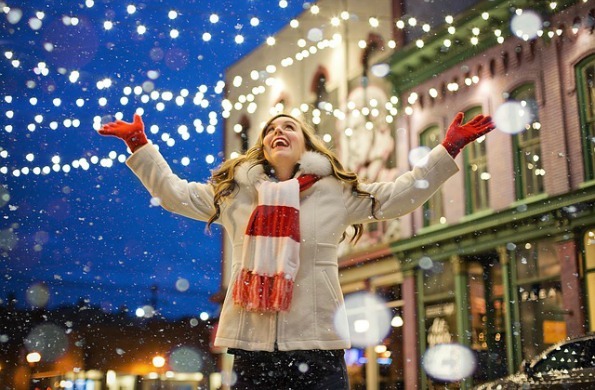 (But it is, just in case you were wondering…) I love this time of year because for one month, the entire world seems to be united in one single thought: CELEBRATION! Yes, everyone everywhere is looking to party and get gifts and to eat as much as they possibly can. Even if you don’t believe in Santa, or a Christ-centered Christmas is not your thing, a feeling of celebration and merriment is still in the air. It is almost tangible, like you could stick your fingers in it and get all pruny. For myself and my family, though, I hope to make our celebration one that revolves around Christ and all that His birth means to the Clarks, as well as to the world. And that is what I want my boys to feel and bask in at this time of year. Traditionally, when we think about Christmas and the the birth of Christ, our minds are immediately drawn to the Christmas story that is found in Luke chapter 2. We read about Joseph and Mary and their journey through the wilderness towards the ultimate event of the ages: the birth of the baby Jesus. When we read this story, there is a sense of loneliness that permeates our souls—how could they possibly be turned away from the Inn? Who in their right mind turns a pregnant woman in labor away?! 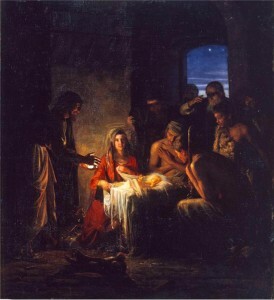 And the actual birth of the baby occurs in solitary confinement—there is only Joseph to help walk Mary through the shadow of death to deliver a son that wasn’t even his. I will admit, just thinking about this and the reality of the situation brings me to tears. Having gone through the experience of childbirth myself, I know that it is difficult and scary at best, and that includes being in a sanitary hospital surrounded by the latest medical technology and doctors galore. I can only imagine that for a girl who was little more than a teenager, this was a dark and dismal affair. And isn’t any trial that we must go through dark and dismal? Don’t we often wonder at the reason for such troubled times? We often stumble along, unaware of what came before or what comes next, just focusing on the shroud of darkness in our way. It is here, though, that I want to turn the tables on this, our Christmas story. We all know through our reading of Luke 2 that Mary and Joseph were not really alone. Angels were watching over them and calling out glad tidings of great joy. A new star in the heavens was even winking its silvery light from the heavens above. Wise men had been journeying from afar to reach the side of this newborn babe, their adventure beginning most likely months in advance. This was an event that was not some random occurrence. It was—and is—the reason for all that is our reality. 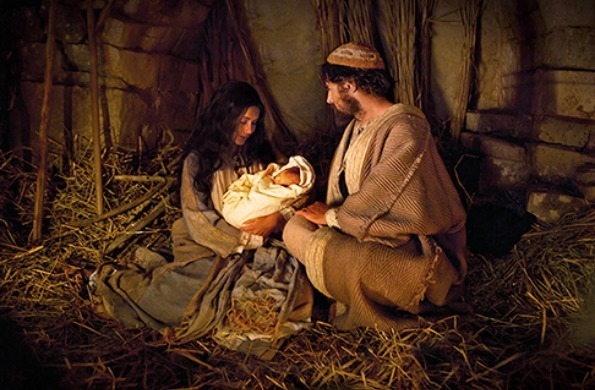 And Mary and Joseph on that day so long ago were the focus of all that we hold dear—yesterday, today, and forever. I have never been one to see what is right before my nose. In fact, it takes a pretty decent amount of time before I can actually see things making sense before my eyes. So please forgive me when I say that I did not fully grasp the reason for the Book of Mormon until a few years ago. That would put me at over 20 years of reading these pages over and over and over again. Pretty frightening when you think about. Something changed in my reading comprehension a short while ago that made all the difference. I began to realize that literally each prophet bares his testimony of Jesus Christ. There are so many powerful witnesses of Christ, his Atonement, and the plan for our salvation. In some way or another, each prophet shares his own experience discovering this testimony for himself. And almost all of them include a special witness of Christ being born. Let me share three of my favorite examples: Nephi, Jacob, and King Benjamin. Nephi. What a guy. What. A. Guy! I love his honesty with himself and with us. He often tells us in his writings just how it is with him, and I have grown to love his honesty. And it is because of this honest approach to his writings that I truly believe his testimony of Christ. Is there anything more humbling than a young man taking himself apart and choosing to ponder on the things of God? That is exactly what Nephi was doing when he was caught away in the Spirit and asked if he believed in his father’s vision of the tree of life. I just can’t get over this bold statement: THOU KNOWEST. It is then that Nephi is given his own vision, because if you read closely, you begin to understand that Nephi is treated to a little bit more than his own father saw. 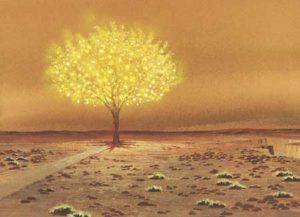 “…after I had seen the tree, I said unto the Spirit: I behold that thou hast shown unto me the tree which is precious above all. I love this. Nephi is speaking with the Spirit of the Lord and is being shown exactly what his father saw, and yet, he is burning to know more. And lucky him, for he is about to witness the Christmas story play out before his very eyes. Which, to us, may seem unfathomable, even silly. But remember, Nephi grew up practicing the law of Moses, and at that time the very reason for this law had been forgotten. “And it came to pass the he said unto me: Look! …and he said unto me: Nephi, what beholdest thou? Even the great prophet Nephi had to start somewhere! I find myself very lucky to be at the beginning of his spiritual journey, and humbled to know that Nephi’s testimony, a testimony that I have relied upon myself hundreds of times, begins with this Christmas story. It is now that Nephi begins to understand and the vision is further unfolded to him. For me, this is as beautiful as the original Christmas story. We get to see the beginning, the middle, and the end of the life of Christ and the importance of this event to mankind. We understand the magnitude of the trial that Mary and Joseph are subjected to. 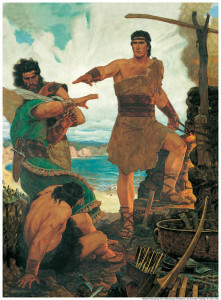 Jacob is the younger brother of Nephi. We first hear about him when Nephi mentions the birth of Jacob and Joseph while his father dwelt in the wilderness in 1 Nephi 18. It is in this chapter that Nephi builds a boat and then sails with his family across the ocean. We learn that Laman and Lemuel tie Nephi to the ship’s mast and how this distresses Lehi, Sariah, and these two younger sons. I can only imagine that this instance weighed heavily on Jacob throughout his life, and was probably a main factor in his decision to follow the example of his brother Nephi. We learn in Jacob 1 that Nephi gave Jacob the plates and charged him with the task of writing only that which was sacred. And Jacob takes this calling very seriously. Jacob also tells us in verse six of this chapter that he and his brother Joseph had many revelations during their time, and knew that Christ would be born and His kingdom would reign on earth. I believe that he and Joseph must have had a similar experience to Nephi, and were also shown by the Holy Spirit the birth of Christ and His life thereafter. Why do I believe this? As I have begun to seek out the testimonies of Christ from each of the prophets in the Book of Mormon, I have begun to notice some similarities. Let me share the testimony of King Benjamin with you and you can decide for yourself. There you have it again—another testimony of the Christmas story shared by a worthy king 121 years before the birth of Christ. As I prepare to celebrate Christmas with my family this year, we are going to search the Book of Mormon and seek out further testimonies of Christ and try to discover the similarities of each. And finally, the next time you read the Christmas Story in Luke 2 and think of Mary and Joseph and their lonely journey, please remember that they were not alone. They had the hope and faith of all the holy prophets and anyone who believed on their word—and that includes all those who came before, and all of us who would come after. It is not a too farfetched an idea to consider just who was there that holy night oh so long ago. This article was originally published in December 2015. Minor changes have been made.